BirdBrain Technologies’ mission is to inspire deep and joyful learning in all students through creative robotics. BirdBrain Technologies cultivates creativity and computational thinking by providing flexible and inspiring products: the Finch Robot and the Hummingbird Robotics Kit. 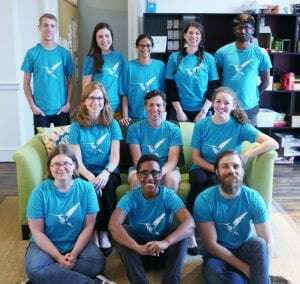 Founded at the CREATE Lab at Carnegie Mellon University in 2010, BirdBrain is a research-based company that promotes gender equality and diversity in engineering and robotics. A large part of our mission is to assist educators interested in bringing computer science and engineering design into any classroom. We work collaboratively to support teachers with free standards-aligned curriculum and professional development. Our products have been used by thousands of teachers around the world to bring creative design and robotics fun into the classroom! Founder, Tom Lauwers, begins research on educational robotics at Carnegie Mellon University. At CMU’s CREATE Lab, Finches and Hummingbirds were made and tested in middle schools, high schools, community colleges, and after-school programs. Dr. Tom Lauwers completes his thesis and BirdBrain Technologies is born. Finch Robot was officially launched. Hummingbird Robotics Kit was officially launched. The second version of the Hummingbird Robotics Kit, Hummingbird Duo, was Kickstarted and shipped. BirdBlox app allows for a tetherless option with the Hummingbird. BirdBrain Technologies wins NSF grant to develop a new robotics kit for elementary school with CMU’s CREATE Lab. The third version of the Hummingbird Robotics Kit, Hummingbird Bit, was created.